Usually I post about the latest arrangements in my own apartment, but I decided to switch things up this month. If you're wondering where I get my knack and love for home decor from, then it's practically in my blood. The answer is: my mama. Ever since I was itty bitty, my mom has decorated in warmer colors and contemporary furniture. When my mom described her vision for a newly designed living room to include cool colors like blue and grey with slightly modern touches, I was super excited. She started with a 9-foot tree which is definitely ideal if you have a high ceiling. The tips are a mix of cashmere, molded, and classic, so it looks much more realistic than a regular Christmas tree (you can see the tips if you enlarge the photos below). At Home makes tree decorating so simple with themed aisles that have everything you need for a certain look. Of course, my mom mixed from different themes and brought them together to create a very well-coordinated Winter Wonderland tree. You can find a variety of trees in At Home starting at $60. One thing I've learned from my mom is that you don't need 20 of the same ornament -- variety is the key to decorating. Play with texture, patterns, shapes, and hues within your color scheme! Not every single piece you have has to match exactly. I've watched my mom decorate our home for years, so I use so many things I've learned as I continue to pull the apartment together including my own Christmas tree. I have to admit that I'm not 100% there yet because MY GOODNESS...it definitely takes time to accumulate! Ornaments are sold individually and in packs at At Home. The prices start at 1.99 for individual ornaments and $5.99 for packs. 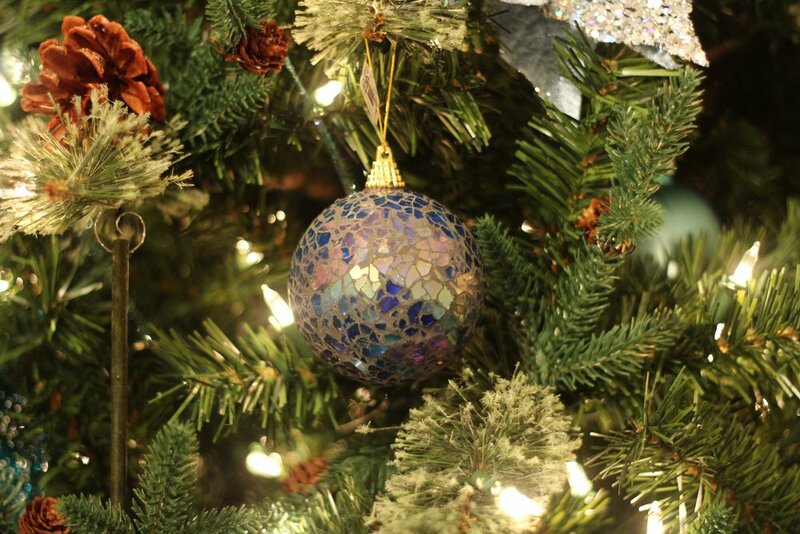 Visit your favorite At Home store and build your dream Christmas tree! This post is sponsored by At Home; however, my mom and I had 100% creative freedom and hope you enjoy! Happy Holidays!